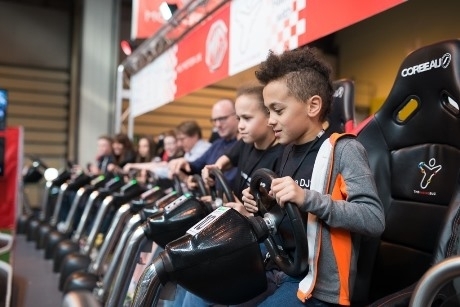 Technology event Gadget Show Live will take place at the NEC Birmingham this Easter, between 31st March until 3rd April, and school visits are welcomed. Teachers who’d like their pupils to learn first-hand about the latest in technology can incorporate a number of talks and meet-and-greets with inspirational tech ambassadors into their visit to the show. A series of educational highlights throughout the event has been confirmed, including the chance to learn about how to live in space with the Think Tank Science Museum, and building your own robot for the Robo Challenge. The Think Tank Science Museum will be exhibiting at the show, encouraging school groups to have a go at space experiments in the style of Tim Peake’s mission to the International Space Station. Pupils can use robot arms to complete set tasks, take part in disorientation training, and see real meteorites and a Sokul suit (Russian space suit). The Robo Challenge is a hands-on activity where pupils will have the chance to build their own robot to take into combat in the Robo Challenge Arena against other visitors’ creations. And carrying on the robotic theme will be BBC Focus which will be showcasing robotic inventions currently in development at Bristol University. The Mad Lab will be asking all budding inventors to try their hand at some soldering, from engineering a lie detector to making some musical bagpipes. Meanwhile, Sam Labs will be offering visitors a chance to race mini skateboards with them after building and coding one of their motor kits. A series of talks and events will take place across the weekend. For career advice in particular, Engineer Your Future takes place on 31st March and encompasses talks and workshops from tech-world figures, career bodies and educational organisations. Gadget Show Live television show presenters will also appear throughout the event on the Super Theatre stage; pupils should keep their eyes peeled for Jason Bradbury, Jon Bentley, Ortis Deeley and Amy Williams. For further information, and to book a school trip, visit www.gadgetshowlive.net/schools. The National Memorial Arboretum in Staffordshire has announced its Remember Together Youth Festival for KS3 and KS4 students, which will focus on World War Two. The Department for Education’s (DfE) Activity Passport has reportedly been downloaded 42,000 times since its launch four months ago. The theme park, located in Catalonia, Spain has a number of new attractions for its 2019 season including a Sesame Street® inspired ride.